This was one of those nights. Megafaun aren’t exactly breaking up, but because each member of the trio has an abundant amount of other projects pulling them in all directions, this show at Baby’s All Right had the feeling that it might be the band’s last in NYC, if not forever then for a very long time. The local musical who’s-who seemed to sense the historic nature of the occasion — either that or Megafaun has a lot of important friends. In the crowd was the author Jesse Jarnow, the writer Richard Gehr, Northern Spy Records founder Adam Downey, Sharon Van Etten and every member of her band. 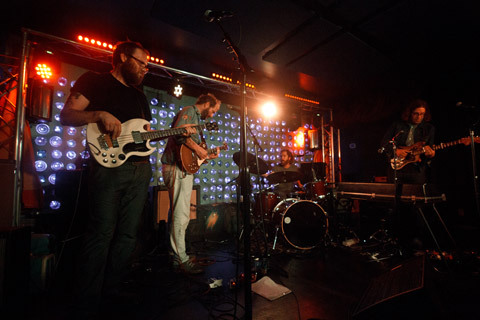 But the most notable celeb in attendance was on stage — former bandmate and recent Grammy winner Justin Vernon joined Megafaun for this seemingly final mini-tour. The band’s set was a bit ragged-but-right, as generally speaking most Megafaun sets we’ve seen have been. This is a band known almost as much for its pure spirit as its songwriting and performing. The setlist included pretty much all of the old favorites you’d want to hear, and one excellent cover that we’re streaming below. There will be plenty of opportunities to see the individual members of Megafaun with their various projects — Brad Cook is in Sharon’s current touring band — but this might have been the last proper Megafaun show. As as a send-off, though, it was a pretty sweet show. This set was recorded by Baby’s FOH Devin Foley with the venue’s installed multitrack system. All I did was mix it down. There was one wrinkle though, as the encore song was played off mic in the middle of the floor. For that song, I only used the two mounted room mics. The sound quality is excellent. Enjoy! This Recording is now Available to Download in FLAC and MP3 and to Stream the Entire Show at Archive.org [HERE]. 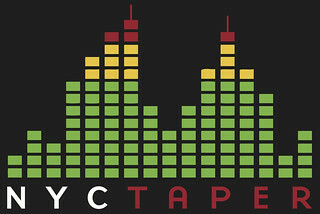 If you download this recording from NYCTaper, we expect that you will PLEASE SUPPORT Megafaun, visit their website, and purchase their official releases including their latest album Megafaun from Hometapes Records [HERE].